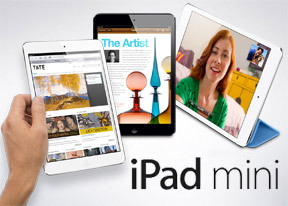 The Apple iPad mini uses a 7.9" IPS LCD display of 1024 x 768 pixel resolution (4:3 aspect ratio, 162ppi pixel density). It's the same resolution as the iPad 2, but scaled down. The pixel density is way below the Retina mark (and we mean the lower threshold Apple sets for tablets), though the display is noticeably sharper than the one on the iPad 2. Before we delve into the issue of image quality, here's a table with some vital specs for the screens of multiple devices. This table should make it easier to compare screen sizes (comparing diagonal size doesn't give you accurate results) and sharpness. 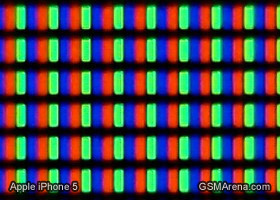 The table shows that you get over four times the screen surface area of an iPhone 5, though at half the pixel density. Compared to the iPad 2, you get around 20% more pixels per inch, though the big iPads have 50% more screen surface area. In short, browsing the web on an iPad mini gives you loads more room compared to an iPhone. Compared to a big iPad, if you hold the mini in landscape mode you'll more or less see the top half of a page that an iPad 2 would show in full. As we said, 7" Android tablets do have noticeably smaller screen real estate, so it's not fair to call the iPad mini a 7-inch tablet. Then again, if you use it the iPad mini for watching videos (which are mostly in 16:9 aspect), you would only be getting 13% of extra screen estate as the old-school ratio of its screen isn't particularly well suited for that. Anyway, let's talk image quality. On an iPad 2 you can easily see pixels in text and icons, while pixels on the iPad mini screen are less noticeable. Still, when you put it next to an iPad 3/4 you see a world of difference. Sure, most people don't have a mini and an iPad 4 side by side, but it's quite likely that they'll have an iPhone 4/4S/5 if they have an iPad mini and each time they move from their phone to their tablet, they'll be reminded of the difference. 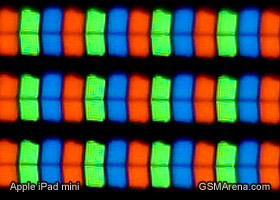 The Apple iPad mini's screen offers less accurate color rendering and lower contrast compared to the Google Nexus 7. On the up side, it is brighter and it has better viewing angles. The iPad mini screen is generally good, but somewhat short of the excellence we expect from Apple. Given the pricing (and ignoring other considerations), an iPad 2 is a viable alternative to getting a mini, but the smaller tablet has the advantage in screen quality. As for Android competitors, the only real downside of the iPad mini screen is the lower resolution, which might be a deal breaker for some and an acceptable compromise for others. The Apple iPad mini measures 200 x 134.7 x 7.2 mm and weighs 308g (312g for the LTE version). It's the slimmest tablet currently on the market by quite a margin. It's a bit too wide, though, - wider than a typical seven incher - and depending on how big your hands are it might be slightly uncomfortable to hold. The handling of the Apple iPad mini is much improved compared to the big iPads. A big part of that is the weight - the small tablet is less than half the weight of the big one. This makes it very easy to hold in one hand and use with the other, something that gets tiring pretty quickly with the full-size Apple tablets. Even though it's quite thin, the smoothly beveled edges mean you don't get a sharp metal edge poking you in the hand. The iPad mini is easy to use on the go - it's slim, lightweight and portable. It fits into pants pockets and while that's not all too comfortable, it means that it will fit into coat pockets, purses and small bags. In comparison, for an iPad 4 you'll need something that can pretty much fit a MacBook Air. The biggest downside of the iPad mini in the handling department is the 135mm of width. This might be a bit too much for you to wrap your hand around but it can't be helped, the 4:3 screen is anything but narrow. Still, the mini is light enough for you to rest it on your hand and there's enough grip to hold it in place. Landscape operation is also quite comfortable, especially if you enable the split keyboard. So, while the full-sized tablets are probably relegated to at-home duties, the iPad mini will see a lot of mileage, potentially making it the iPad of choice for many people.